After saving the King, our little mice are back! And the new challenges are big! Prince Collin and his friends will have to sink into darkness if they want to save the castle from the evil that is hidden there. With a new storybook, horrible opponents, new equipment and skills, but fortunately a new ally, Nere, the big adventures of Mice & Mystics' little mice are far from over. Be careful this game is an extension of Mice and Mystics and cannot be played alone. 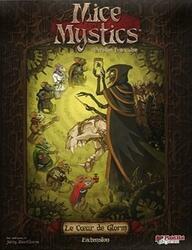 To be able to play it you must have a copy of the game Mice and Mystics .